It's really hard to find a good place to sleep in Manchester, especially if you have to travel on very early! The YHA is the one I liked best. 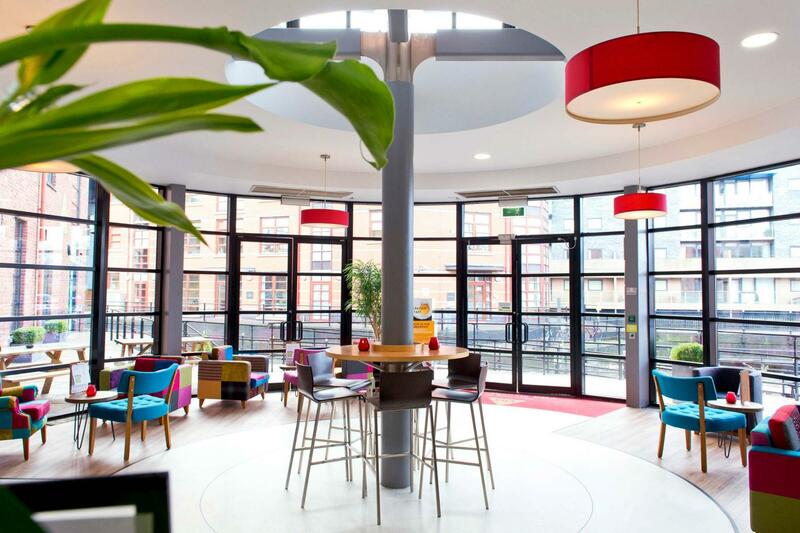 Just a gentle walk from the city centre, YHA Manchester is a purpose built hostel, ideal for travellers looking to vibrant social spaces and the comfort of well-appointed en-suite bedrooms. Manchester itself is one of the UK’s most exciting cities, with attractions aplenty to enjoy - whether it’s art, museums, music or impressive sporting stadia which take your fancy. With 24 hour access available too, YHA Manchester is a great base for visitors seeking to take advantage of the city’s vast nightlife options. YHA Manchester has 152 beds in 37 rooms. All of our rooms are en-suite for your comfort and convenience. The beds at YHA Manchester are set out across a range of room types: 2 bed, 4 bed, 5 bed and 6 bed rooms. Facilities at the hostel include a café/licensed bar, conference rooms, restaurant, TV lounge and games room, laundry, Self catering kitchen, free parking for residents, 24 hour reception, FREE WIFI and computers available to access internet. We've recently opened up the ground floor communal areas to improve the ambience of our cafe/bar. We've also got new furniture and added more toilets and showers to the hostel. Our Café & Bar provides a great place to meet fellow travellers, share stories and chat about your plans and if you need any ideas for what to do in this vibrant city. Offering a broad selection of delicious food, alongside a range of freshly made hot drinks and a well-stocked bar. Open daily to guests and passers-by, let us welcome you to rest your legs and indulge your senses after the day’s sightseeing. Energise your outdoor adventure with a nutritious packed picnic lunch. Prepared for you on request, our delicious packed lunches include a sandwich with a selection of fillings to choose from, a chocolate, a bottle of still mineral water, a packet of crisps and a piece of fresh fruit. Parking: There is a car park at the hostel. You will need to log your car registration for guest parking on our electronic screens on arrival. Please ask at reception if you are unsure. Pets: Pets are not permitted at YHA Manchester. Assistance dogs are welcome. YHA Manchester is ideally located for school groups to take advantage of all Manchester has to offer, from its cultural and historic sights to its outdoor action and adventure attractions. This hostel has room for up to 136 people, classroom facilities and ensuite accommodation for teachers. At YHA Manchester we have three meeting rooms available for hire. Capacity: Up to 60 delegates in Room 1, up to 48 delegates in Room 2 and up to 30 delegates in Room 3, depending on seating configuration. Available Equipment: Flipchart stand, extension lead, three powerpoint projectors, screen, overhead projector, three white walls. Parking: Facilitator parking is free, however there is a charge for delegates of £2 for two hours, £4 for four hours, £6 for eight hours and £10 for 12 hours. One facilitator may register their car for free at reception. Accessibility: All of the meeting rooms are accessible but if wheelchair access is required, it will affect the maximum capacities for the meeting rooms as wider walkways will be needed to accommodate wheelchair users. There is ramp access to the front of the building, lift access to all the floors and accessible toilets on all floors. There is one accessible parking bay in front of the building. For more information please see our access statement. Air conditioning: There is no air conditioning in this meeting room but we do have fans available for hotter weather. We have one small heater on site for colder weather. YHA Manchester was opened in 1995 and enjoys a stunning canal side location in the historic Castlefield area of Manchester. Castlefield was England’s first urban heritage park and features prominently in the history of Manchester, from the birth of the city at the roman fort “Mancumium” via the railways, canals and warehouses of the industrial revolution, to the buzzing culture and nightlife of today. The hostel is on Potato Wharf, an unusual street name with a tory of it’s own! Legend has it that it’s so called because in the 19th century food and comestibles were unloaded all along the basins, but it was at this wharf that the staple food of poor working Mancunians, the humble potato, was unloaded and taken along the narrow lane to the nearby St John's Market. Olly has spent most of his adult life working for YHA in many of our fantastic locations and is now the proud manager of YHA Manchester. As an experienced traveller himself, Olly is ideally suited to Manchester and loves chatting to and sharing experiences with our customers. Olly is a friendly, outgoing character with a youthful outlook on life who enjoys socialising and generally having fun! Our staff at YHA Manchester are from all over the world, Ecuadorian, Spanish, Australian...and there’s even a few true Mancunians too, what unites us all is a love of Manchester and we’re always happy to share our local knowledge with our guests. Manager recommends: If you're in Manchester for a weekend break, book a taster session at the Chill Factore and learn to ski or snowboard indoors on real snow. Airkix indoor skydiving centre offers an experience like no other. Learn the basics of skydiving on the indoor wind tunnel and have a blast on your city break!